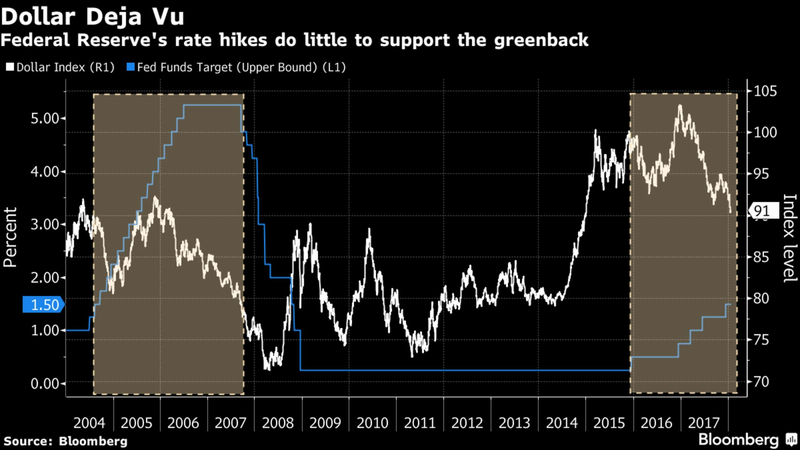 Traders wagering on a dollar revival as the Federal Reserve continues raising interest rates need only look back to America’s most recent tightening cycle to see just how wrong those bets could go. That’s the message from Credit Suisse Group AG and Amundi Pioneer Asset Management, who see numerous similarities between the global macro environments of 2004 and now. Brightening outlooks in Europe and China, rising commodity prices and scaled-back stimulus abroad are overshadowing continued U.S. rate hikes and fiscal accommodation. Moreover, a spending impasse in Washington underscores the political headwinds facing a greenback already off about 9 percent over the past year. While lawmakers on Capitol Hill moved to reopen the U.S. government after a three-day shutdown, expectations for the world’s reserve currency among traders, investors and strategists remain depressed. The 2004 situation mirrors dollar bulls’ plight over a decade later. Growth in the euro zone has outpaced the U.S. for the past two years, while China’s economy is on the upswing, with growth accelerating on an annual basis for the first time since 2010. Meanwhile, commodity prices are hovering near the strongest levels since 2015. The International Monetary Fund boosted its 2018 worldwide growth forecast to 3.9 percent Monday, in what would be the fastest pace since 2011. Similar to the prior episode, the currencies of those faster-growing economies will likely outshine the greenback in the years to come, according to Paresh Upadhyaya, a portfolio manager at Amundi Pioneer Asset Management, which oversees about $83 billion. Further clouding the greenback’s outlook are expectations the European Central Bank is poised to dial back its quantitative easing program over the coming years, a sentiment that already has the euro on the cusp of levels unseen since late 2014. Though the Fed raised interest rates 17 times from mid-2004 to mid-2006, the ECB embarked on its own hiking path in late 2005, drawing investor attention across the Atlantic. The fading influence of U.S. monetary policy on the greenback may be another manifestation of the global reflation trade, according to Oliver Harvey, a London-based macro strategist at Deutsche Bank AG. As investors look beyond U.S. borders to capture rising growth around the globe, asset allocation has shifted away from America and into faster-growing regions. As a result, the euro-dollar exchange rate has become unmoored from the widest yield gap between two-year U.S. and German debt since the 1990s, which would typically signal dollar strength. The rotation out of still-expensive U.S. assets into more attractively-priced investments abroad matters more for the dollar than relative monetary policy stances, according to Harvey. Monday’s stopgap spending bill out of the U.S. Senate, which will fund the government through Feb. 8, did little to ease the political pressures on the greenback that have helped fuel the currency’s 2 percent rout to start the year.